Get that Ultra Groomed look with premium and ultra finished packaging of MEN DESERVE Grooming Kit essentials. Look tough without feeling rough. This beard softener with Vitamin E leaves skin feeling energized and keeps your facial hair in its best condition. It contains Botanical-rich Jojoba and Almond oils that keep hair strong, shiny, moisturized, and super nourished. Men Deserve Beard Wash is a gentle pH balanced cleanser, it removes dead skin cells, impurities & environmental pollutants from skin and beard. It leaves your beard and skin feeling smooth & fresh. It has a very gentle lather that is soft enough for your face and tough enough to handle curly, coarse beard hair. This product is great for all skin type, especially for sensitive skin. Ultra Premium styling product from Men Deserve. This hair cream is the best for strong hold hair styling with high end hair care. Whether your hair is a curly or straight, an undercut lets you make a statement with what you've got. Flatten your hair down with a comb, craft a classic pompadour or create a messy style: the options are endless. Whatever your style, a slick of paste will keep it fresh and lasting all day. 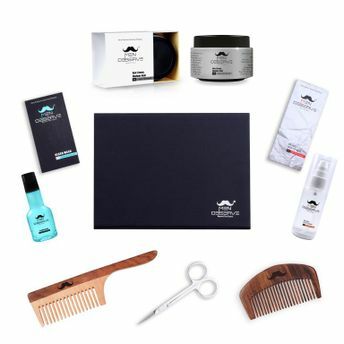 Men Deserve Neem comb is designed specifically so that the points are not too sharp and you can get an excellent stimulating effect as the comb teeth glide over your scalp. Not only do the natural and environment friendly Neem combs feel wonderful, but they do a great deal of good to your scalp health. Regular combing with this combs is believed to inhibit dandruff as well as scalp infections. This scissor is ideal for grooming and trimming beard and mustache. It is designed with thinner, shorter blades to safely and easily trim unwanted hair from beard and mustache. 100% brand new and high quality! -Sharp blades to allow for precise control, sharp point make precision cuts easy. It is durable and an ultimate grroming tool. Explore the entire range of Gels & Waxes available on Nykaa. Shop more MEN DESERVE products here.You can browse through the complete world of MEN DESERVE Gels & Waxes .